The summer is here and with it comes the big-mega blockbusters! And as a tribute to First Responders and to Firefighters specifically (and fittingly to the NYFD who turn 150 this year), Dion Baia and J. Blake are taking on a classic ’70’s epic, back when Special Effects weren’t just Computer Generated Images with actors in front of green screens, but when practical effects were the norm. Oh yes, once upon a time stunt men did it all for real, detailed miniatures and matte paintings expanded our world. No one did it better than legendary producer Irwin Allen. 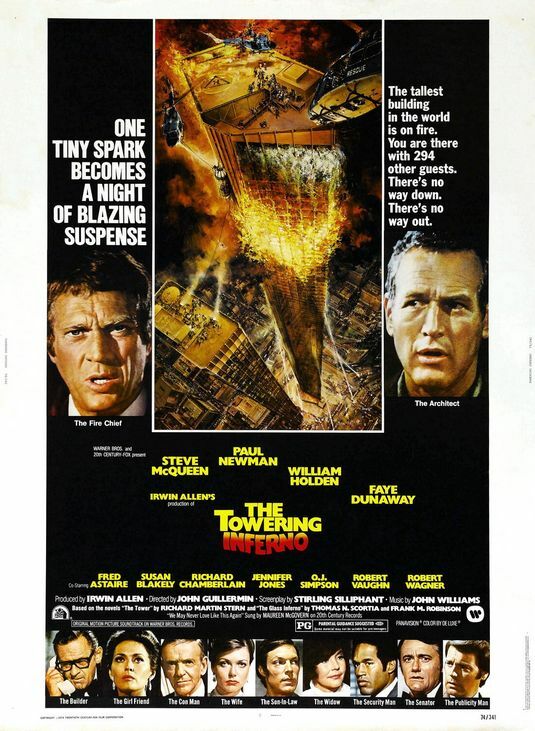 Saturday Night Movie Sleepovers takes on arguably his quintessential film in his hugely successful series of disaster flicks… We’re of course talking about The Towering Inferno, from 1974. Blake and Dion analyse the film within the context of the mid-70’s, in a pre-Star Wars era, where the hottest thing going at the time were disaster movies and various procedural shows on television which spawned toys, action sets and board games. The boys also consider the film in the context of a post-911 world… is the romanticism of these movies forever lost? And is there actually a longer cut of the film made for television? Is composer John Williams‘ most sought after piece of music actually in this film? How do those practical effects hold up today verse modern CGI? And did Steve McQueen actually have a lisp when pronouncing “S’s”?! Well all these questions and many more will be answered in this brand new, epic edition of Saturday Night Movie Sleepovers!